There was a buzzing sense of adventure at Emporio Armani, catalysed by a collection grounded in all things aeronautically sci-fi. Future fighter pilots stormed the runway. In all shades of grey, navy and plum came a wash of futuristically asymmetric lapels – often high on the chest – alongside subtle digital prints and shiny puffed-up outerwear. Shearling-lined aviator hats, dark sunglasses and glossy helmets joined the ranks as the collection progressed into heavier territory. ‘EA7’ splashed across space overalls and sweaters brought Emporio Armani up to date with trending slogan warfare. 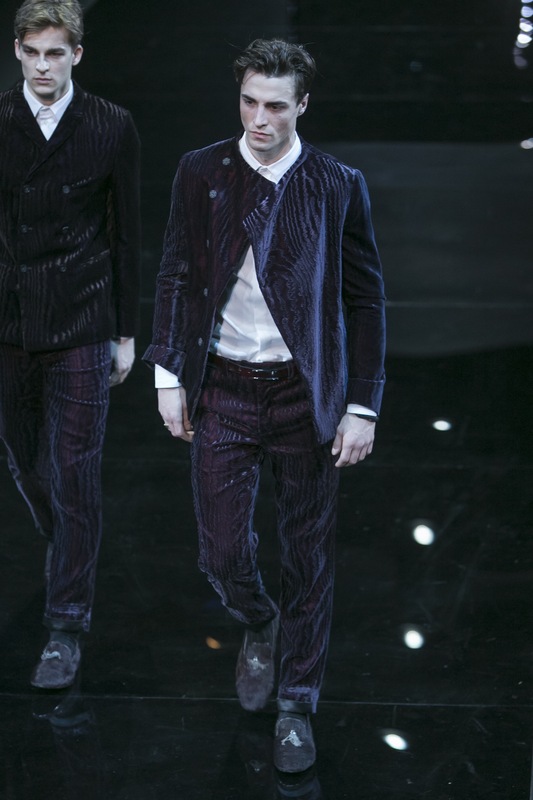 As always, Armani’s most impressive element is its precise fusion of casual and signature eveningwear. For even those overalls had an overwhelming feeling of composure to them – no mean feat for a onesie. Put simply? Zero fuss, zero gravity. With such a uniform, a fighter pilot would have to have space rocks in the head to fly for any other team.